FOX NEWS EXCLUSIVE – Satellite images shot Thursday and obtained exclusively by Fox News have revealed a new Russian deployment of Iskander missile batteries and launchers near the border with Ukraine. The intelligence report by Imagesat International showed the new deployment in Krasnodar, 270 miles from the border with Ukraine. 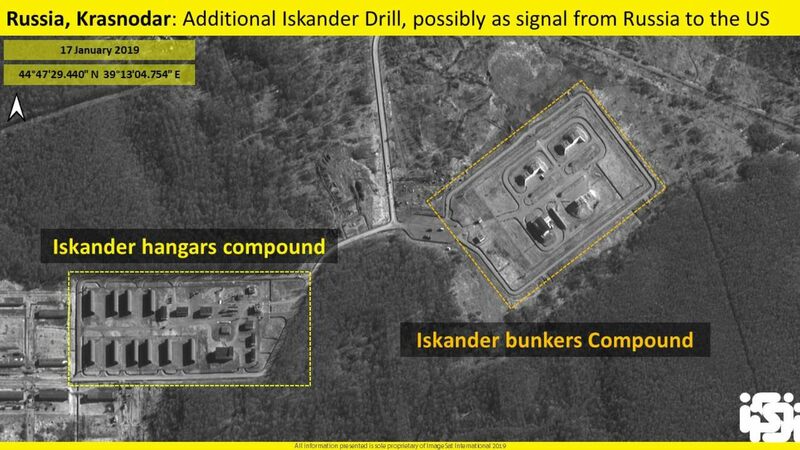 The images show an Iskander compound, with a few bunkers and another compound of hangars. Near the launcher, there is a transloader vehicle which enables quick reloading of the missiles into the launcher. One of the bunker’s door is open, and another reloading vehicle is seen exiting from it. The Iskander ballistic missile has a range up to 310 miles, and can carry both unconventional as well as nuclear warheads, putting most of America’s NATO allies at risk. The second deployment is near the border with Mongolia, in Ulan-Ude in Sothern Russia, where there are four launchers and another reloading vehicle. Earlier this week, Nikolai Patrushev, secretary of Russia’s Security Council, said authorities of the former Soviet republic are being “controlled” by the West, warning it stands to lose its independence and identity as a consequence. “The continuation of such policy by the Kiev authorities can contribute to the loss of Ukraine’s statehood,” Mr Patrushev told Rossiyskaya Gazeta, according to Russian news agency Tass. Last November, three Ukrainian vessels and 24 Ukrainian soldiers were fired at and captured by Russian coast guards in the Black Sea, exacerbating tensions between the two countries. The incident marked the most dangerous direct clash in years between the neighbors. Yesterday, a Moscow court has extended the detention of eight captured Ukrainian sailors despite protests from Kiev and the West, defence lawyers said. The Russian Navy captured the seaman on November 26 2018, escalating the conflict with Ukraine over the annexation of the Crimean peninsula back in 2014, a move most of the world views as illegal. Fox News has reported of further Russian troops deployment and S-400 Surface to air missile days after the escalation started, hinting Russia might have orchestrated the naval incident. Earlier Thursday, President Trump called to expand The US defense program. During an appearance at the Pentagon, he says “our goal is simple: that we can detect and destroy” any incoming missile. Part of the new strategy is to create a level of sensors in space. The president says that America’s adversaries are “increasing their lethal strike capabilities” and that his “first duty is defense of our country.”Yesterday, the Under Secretary of sate for arms control and International security, Andrea Thompson, confirmed the US intention to withdraw from the 1987 Intermediate-range Nuclear Forces (INF) Treaty, after a failed meeting with the Russian delegation in Geneva.